What to see and do at Disney [for Free] during the Holidays. I had originally written this for my sister, but I thought it would be fun to share with all of you. Walt Disney World was always one of my favorite places to visit during the Holidays while I was younger, but as I get older I realize just how expensive visiting the parks can be. But, the nice thing about Disney is you can still experience some of that same holiday magic without dropping $100+ on park tickets (each). If you are not staying on Disney property or are a local I would suggest parking your car at Downtown Disney. Parking is free and you can hop on a bus from there anywhere you want to go. From Downtown Disney I would hop on a bus that takes you to Disney’s Boardwalk Inn where you will find a gingerbread version of Santa’s Workshop. 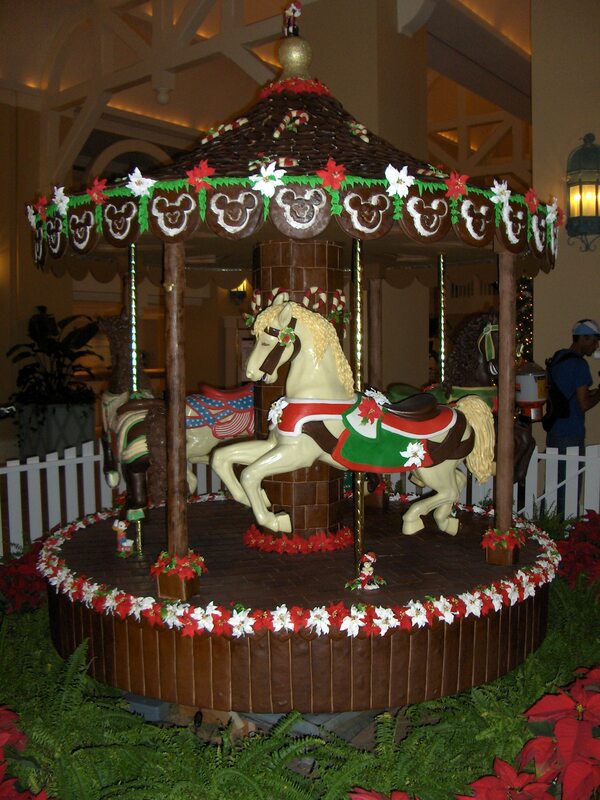 From there take the walking path to Disney’s Beach Club Resort and visit the resort’s signature gingerbread carousel. 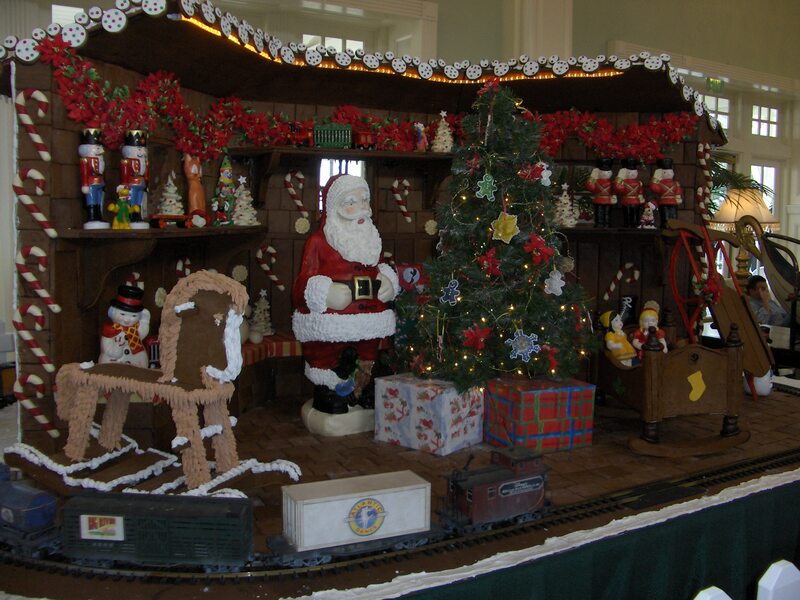 Next door at Disney’s Yacht Club is the famous gingerbread train display. Hop across the water via the connecting bridge to Disney’s Swan & Dolphin Resort. 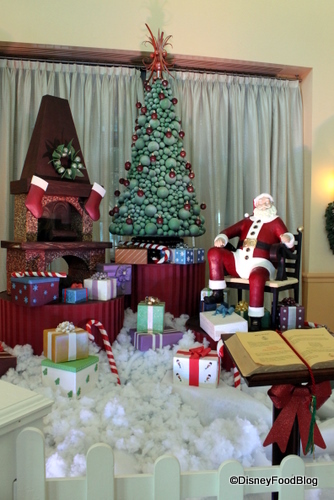 This year the Swan & Dolphin has introduced a scene with Santa Clause made completely of chocolate! The Swan & Dolphin has decorating demonstrations and various other events offered for free during December. I would check out this post at the Disney Food Blog for details. From the Swan & Dolphin I would either take the free ferry or walk the mile path to the entrance of Hollywood Studios. Hollywood Studios is the only one of the 4 Walt Disney World Parks to display their annual Christmas tree outside of the park entrance. From Hollywood Studios you can hop on a bus that will take you to the Ticket and Transportation Center. From there take the resort monorail to the first (or second?) stop at the Grand Floridian. My favorite: the Life Size Gingerbread House. Purchase a chocolate covered shingle and thank me later. 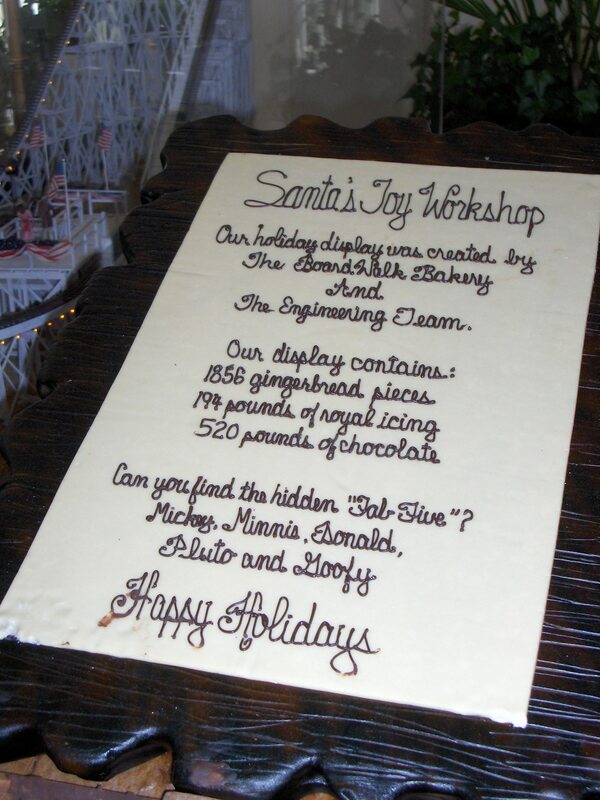 The Grand Floridian offers FREE decorating demonstrations Monday – Saturday at 1:00pm until January. There’s also the gorgeous tree in the hotel where you can snap a few holiday photos. After enjoying the house I would hop back on the monorail and go two stop to The Contemporary and track down the Gingerbread Christmas Tree. 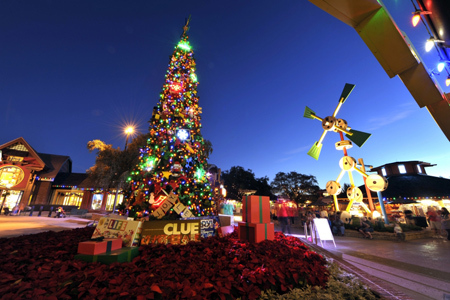 From there you can head over to the Wildnerness Lodge or the Animal Kingdom to check out their beautiful rustic Christmas Trees or head back to Downtown Disney and enjoy the nightly Holiday [free] activities. More information on Downtown Disney’s Festival of the Seasons can be found here. As you can see, there is a TON to see and do [for FREE] at Walt Disney World! If you are a local I highly suggest checking it out or if you have a free day while you are here during the Holidays this is a great way to save some money on your vacation. And if you do feel like enjoying the park – take advantage of Mickey’s Very Merry Christmas Party. I want to go to Disney so badly again. It really is the happiest place on earth. I plan on taking my daughter in the summer of 2012 because she will be old enough to really like it then. This sound like so much fun!! I’d definitely be right into those decorating demonstrations. You’re lucky you live so close to so many fun Christmas events. Have a fantastic day Meghann! Being at Disney around Christmas time looks and sounds like so much fun, but yet I’ve never done it. The life size Gingerbread house looks so cool. I’m definately checking out those Disney Blogs for info for while I’m there! And I’m still crossing my fingers for warmer weather!! These are awesome ideas! Just a forewarning though – technically bus service is only “free” to Disney ticket holders and guests of the resort. In busy times they might ask to see a room key or ticket. Just a warning so people aren’t surprised! This is true. But, in the 25 years I’ve been going to WDW, I’ve never had a bus driver ask for my ticket or room key. So glad you posted this! My husband and I are going to be “alone” for Christmas this year & we decided we’d go to Disney for the day! The activities on this list will keep us busy and let us see parts of Disney that we’ve (sadly) not seen yet! Awesome. This definitely needs to go in favourite posts. I live really close to Disneyland… I miss going around Christmas! It’s so expensive. Love the face of the woman behind you and Derek in the last photo. Lol! Great post! I was thinking about heading down to Disney tomorrow. The weather is looking like rain all day though, so we may not go. But we will get down there sometime soon! Either one of those pics of you and Derek would have made FANTASTIC Christmas cards! Bite the bullet next year, even if he hasn’t “put a ring on it” 🙂 Thanks for sharing some Christmas Magic. oh, i’d give anything for my my husband and i to be able to go to disney world for christmas!! he’s never been! maybe one day….it’s our first married christmas (we’ve been married for almost 6 weeks!) so maybe that will be a trip we’ll take one day! Yay!! This guide is so helpful and exactly what I was looking for! My husband and I are planning to spend a day at Disney doing holiday stuff for free, so this is perfect. Thanks for posting! These are great tips! And definitely a way to get the Disney magic for free! Gingerbread carousel? How adorable. 😀 I can’t waaaaait to go back to Florida soon. Fun Fun Fun!!! I really wish I wasn’t so far away in Michigan, I would totally take my 3 kids during their Christmas break!!! jen recently posted..Weigh In Day 121310and much more! I swear nobody does Christmas like Disney! I really never appreciated this until now (with kids), but there is always something to see and do. Thanks for sharing this!! I’ll be in Orlando over New Years–do you think they’ll have all of this still up then?? Yes! They keep everything up until Jan 6th I think. I’m going to Disney on Dec. 28th through the New Year so this could not have come at a better time.. thank you! This post really made me want to go back to Disney.. I went for Christmas one year and it was so magical!! So jealous you live right by there! Love it!! You are so lucky to live so close to my favorite place EVER. I’ve only been once at Christmastime and it was early on so not everything was quite up yet. Thanks for posting this, I just forwarded it to all my family, they’ll love it, too! Aww, I love Disney. I bet it’s amazing over Christmas. as a Disney travel agent, I love this post! Disney is awesome esp at Christmas! I am hoping to go at Christmas next year! Great post! I will be in Orlando for new years and my friend and I already decided that we were going to tour the hotels. There is so much to see and you’re right it is an easy free day! What loads of great ideas!! We often have a ride on the monorail or get the boat to Fort Wilderness Lodge! !